Right, so, ” teething cream” sounds super weird. No? But here’s the thing. You can buy teething gel at the store. I’m not entirely sure how to make a gel at home with safe ingredients…nor am I sure that it’s the most effective idea. But last week we ran out of teething tablets. Even though we have an amber teething necklace, which the boys wear 24/7 (although Daniel is no longer teething, he just likes it), there are still random times when the pain is enough to make Jacob edgy and restless, which makes for a poor night’s sleep. Teething tablets have been the perfect answer to take away whatever dull ache or slight pain that keeps him up at night. And then we ran out. Creative genius that I am (ha? ), I thought, “What can I use at home to help him?” Because I did not want to run to the store. I remembered that cloves are good for teething pain, and I had that. But what to pair with it…. Several minutes of brainstorming later, and one quick search for an ingredient I haven’t used in months, and I had my answer. This formula combines coconut oil, cocoa butter, and cloves for a creamy, stick-to-the-gums, totally edible and safe cream that also happens to relieve pain. Add your coconut oil and cocoa butter to a small saucepan. Place the pan on the stove over low heat until they are just melted. Add your cloves and let this steep for 20 – 30 minutes on very low heat (just enough to keep the oils from solidifying). Then, strain the oils through a piece of cheesecloth. Discard the cloves, and pour the oil into a 4-oz. glass jar and let it cool completely. 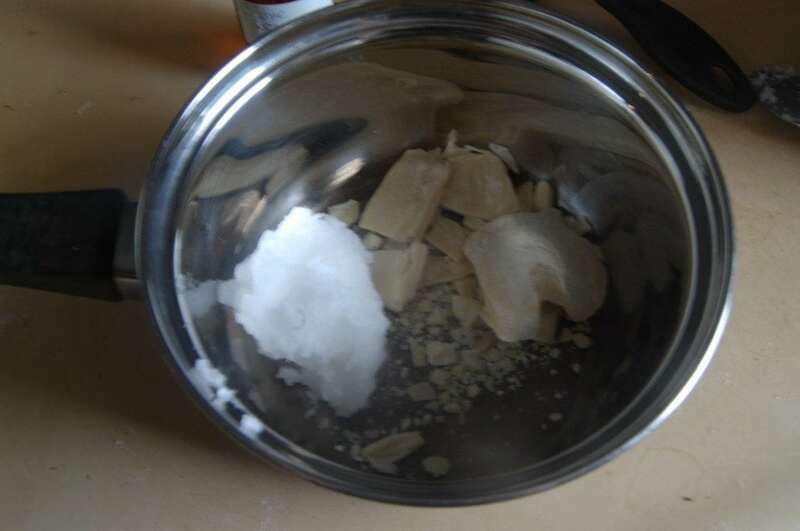 (You can place the jar in the fridge to speed up this process, and can even store it there so the mixture is chilled when you initially give it to the baby.) Interestingly, if left at room temperature, it stays a liquid. If you put it in the fridge to solidify then remove it, it becomes a very soft solid. This was unexpected. I’d recommend storing it in the fridge so it’s cool for baby, and less messy. To use, take a tiny amount and massage into the baby’s gums. This can be used on adults with toothaches, too — it’s not just for babies! 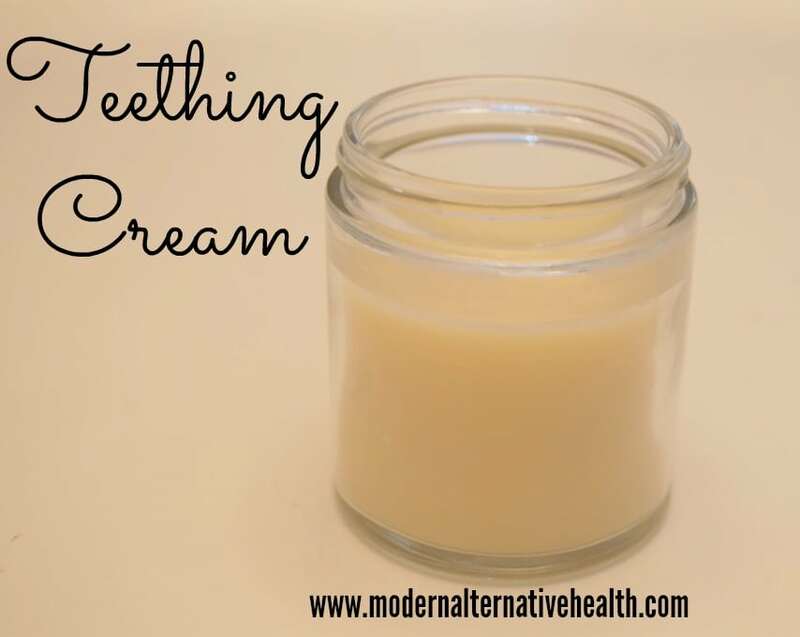 Have you ever tried teething cream? Do you know if Trader Joe’s or Whole Foods sells the food grade cocoa butter and if so, which section of the store it would be in? What a simple, handy recipe! I will bookmark this for the future when I have little teethers! This is truly a “”mom-gyver” moment! I love when moms (or dads) fix a problem in their home with sheer ingenuity, frugality, and the stuff on hand. Cheers to you Kate! Kate! I LOVE YOU!!! 🙂 I’m totally pinning this. I’m so thankful for this recipe! I’ll most definitely be using it when my littlest reaches that joyful stage 🙂 I used teething tablets for my first two but always jump at the chance for something homemade. I tried searching everywhere for clove oil for my son when he started teething (about 9 months ago). A Whole Foods employee cautioned me against using their brand in my son’s mouth/gums because it was was not food grade. Unfortunately, I couldn’t find it elsewhere. Have you ran into this before? Where did you buy yours online? What brand? I’ve successfully used ground cloves for teething since my baby first started getting sore gums at about 3 months old. I just wet a clean finger and dip it into the ground cloves then rub it over his gums. It usually stops the pain quickly and I don’t have to worry about him eating essential oils that might have traces of solvents from the extraction process. I love this! 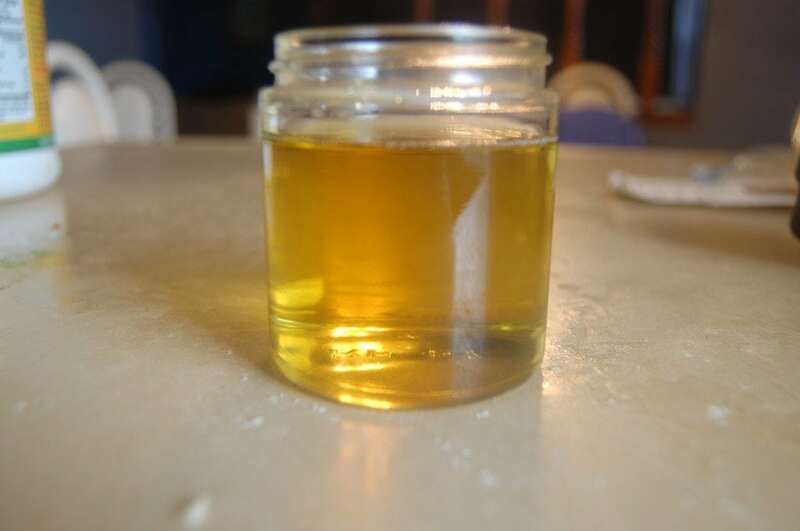 I’ve dont clove oil with a carrier oil a few times and wasn’t too happy with it because I didn’t feel like it was helping much. This is a great idea to make it nice and thick to stick! We just started using an amber teething necklace and so far it’s been awesome but next time I need to apply something topical I will try this! thanks!! This Is Awesome I know alot of Parents that will love this, Plus Ill keep it in my books for when we have lil ones teething Keep up the Good Work! I haven’t been able to find a food grade cocoa butter. Mountain rose herbs says that theirs is organic and pure but it doesn’t say food grade. Would that be ok? Based on looking at your lovely pictures above, it looks like you measured out 1/4c of CO and cocoa butter while they were still solid? When a recipe calls for coconut oil I’m always confused if you measure it while solid or measure it when it’s melted. But for this recipe do I fill my 1/4 c measuring cup with solid CO and butter? Bear with me, I’m new to some of this and I’d love to try this recipe! Where is a good place to get the cocoa butter? I am curious as to where you get the cocoa butter and what is the brand? I tested this first on my own gums and can’t seem to taste any clove – I know clove is strong but I would expect if I can’t taste/feel anything I need to add more oil. Thoughts? what about using coconut butter instead of cocoa butter, I couldnt find food grade near me? Would this be safe to use to relieve the pain of tongue/lip tie revisions? Brilliant idea! This is absolutely helpful for many moms out there, thinking of the best alternative for curing a teething baby. Clove oil is definitely the most effective and safe homemade product that can be used for overall dental health including sore gums and toothache. Butter and coconut oil are amazing recipes, too. Thanks for sharing this, this is much appreciated. I’ve actually tried this recipe once, measured both as solid, and my LO has loved it. However, did you measure both solid?? And if so, do you have any trouble with consistency between batches…especially with the Cocoa Butter?? Hi Kate, quick question- I just made this for my 3 month old who is just starting with the gum pain (pre-teething). She loves it! But do you have any idea of the shelf life of this? I let it solidify in the fridge, but I have to keep it out now so that it is plyable enough to use (otherwise, it is too hard to even give her any). But if I keep it out in the cupboard, how long should it be good for? I love this for my little one who is 15 months, we normally leave it in the diaper bag, and if he sees it, he asks for it and usually wants more after I apply it, so i do. I am not sure what I did wrong, I followed the recipe and it stays a slightly soft solid state even left at room temp, though I should say I live in Maine so it has not been super warm since I have made it. It does seem to help his teething pain and discomfort so it doesnt matter. 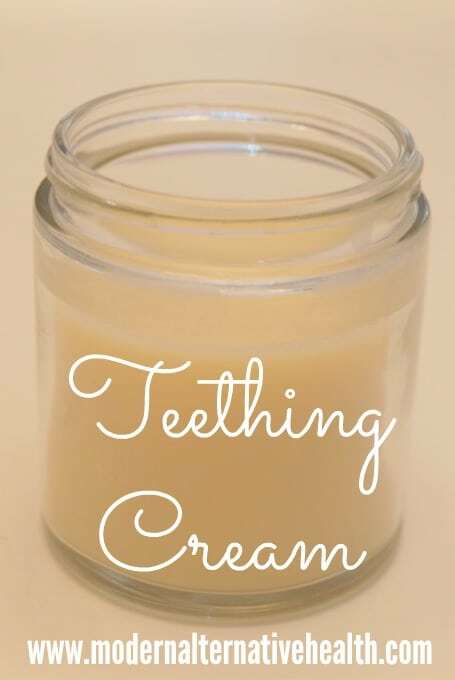 it works so well my MIL has asked for it for a friend who has a baby with sore gums. My husband has used it for a toothache as well. We both tried it anyway before we gave it to our then baby teether and it tastes pleasant, as I would expect. Thank you so much for this recipe it is awesome! Is this recipe suitable for a 4 month old ? I would use whole cloves steeped in the oil instead of the essential oil, but yes.